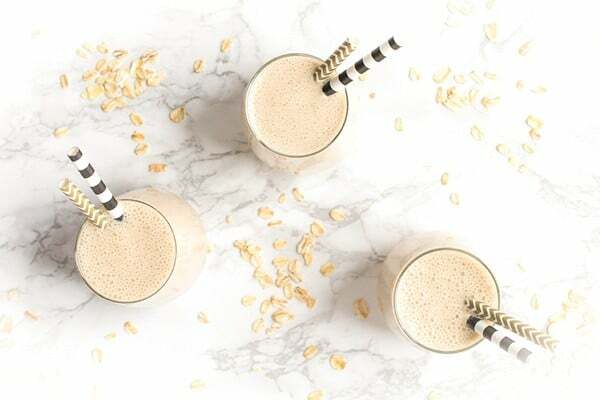 Ripe bananas and natural peanut butter create an addictive, salty-sweet flavor combo in this protein-packed Peanut Butter Banana Oatmeal Smoothie– perfect for breakfast or any time of the day. Hi. My name is Liz and I’m a peanutibutter-aholic. Specifically, I am addicted to Koeze natural peanut butter roasted locally here in Grand Rapids. It’s a problem, friends. I can’t get enough of this peanut butter made with two simple ingredients: roasted peanuts and sea salt. Aside from maybe chocolate, few foods taste better with freshly roasted, salty peanut butter than a perfectly ripe banana. My Peanut Butter Banana Oatmeal Smoothie combines the best of both worlds and is morphed into a well-rounded breakfast thanks to yogurt, milk and oats. Speaking of yogurt and milk, this marks the third and final easy, no-cook dairy recipe that I demonstrated at the Mitten Moms conference. With kids back in school and the return of hectic morning schedules, this smoothie comes together in just minutes similar to the Overnight Refrigerator Oats and Avocado Toasts shared previously. Thanks to the protein and vitamin packed dairy ingredients, all three of these breakfast ideas will give your family long lasting energy throughout the morning and avoid a mid-morning sugar crash. What is your favorite no-cook breakfast recipe?? I’d love to hear from you in the comments below! 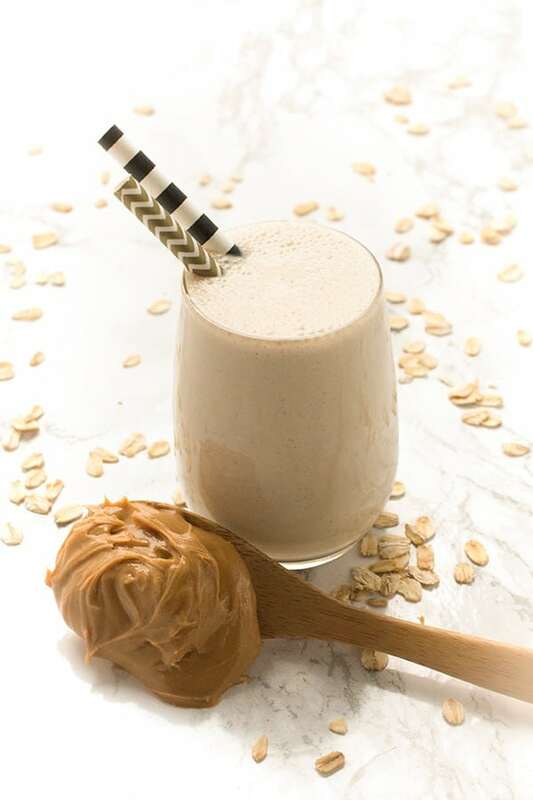 Ripe bananas and natural peanut butter create an addictive, salty-sweet flavor combo in this protein-packed Peanut Butter Banana Oatmeal Smoothie. For a thicker smoothie, add more ice. Want more delicious smoothie recipes? Check out my Pinterest board! If you wanna get crazy…use chocolate milk. Fairlife is really tasty and has extra protein and relatively low sugar for its taste. This might be a stupid question, but when the recipe says scoops of ice, is that ice cream or ice? I’m so glad you enjoyed it Carrie!! Now I’m craving it too! Oh no I’m sorry you didn’t like it. It’s one of my favorites! Add almonds and less ice, oats, and peanut butter makes the smoothie 100 times better!! but it was a decent smoothie!!! Glad you found a way to make it your own! I’m so glad you enjoyed it Britany!! Made this with my homestay sister today, we both loved it. Instead of normal milk, we used half normal and half coconut milk and it was super creamy and delicious! Took me 40 minutes to finish the whole glass and I feel super full- I won’t be needing any midnight snacks or anything. Thanks for this awesome recipe! I’m so thrilled you enjoyed it!!! This smoothie was SO good! I didn’t really follow the measurements and got a bit of a thick paste which I still ate of course but with a spoon. I used yogurt and no ice and found it more dense yet really good. Also blending with it nuts or crunchy peanut butter was a big YES. Thank you, its the perfect on the go breakfast, super filling! Really good! reduces the urge to snack! Really good! Thanks….reduces the urge to snack! Hi Jenn – Do you see the nutrition facts next to the recipe? That is for a single serving. :) Enjoy! Oh I’m so glad to hear it!! Thanks much for the recipe! I did have to alter it, and cut out all dairy, but it works well with just water. Oh perfect – so glad you still enjoyed it! Silly question… Do you cook the oats? Not silly at all but no you use raw oats! Enjoy!! 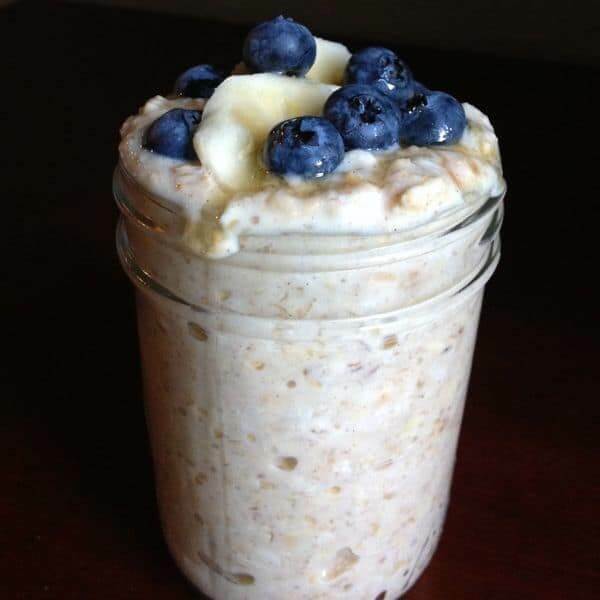 What kind of oats do you use for this smoothie? Quick, old fashioned, or does it matter? Thanks. Awesome smoothie!! I like to freeze my peeled bananas rather than add I’ve. Mmmmm so very yumm! That’s such a smart idea!! This has my name all over it! I love everything about this! We’re totally peanut butter-aholics over here as well.. spoonfulls out of the jar baby. I wish this was my current breakfast. I tried this smoothie this morning and it was great! I do have a question about the nutritional data. I’m on a special low calorie diet and when I calculated the calorie count I got 560, per serving. The only change I made was using non-fat Greek yogurt. Just curious how you calculated 294. I’m hoping I goofed somewhere because 560 is half my daily calories! Oh my goodness, this recipe should have been marked as 4 servings, not two! Please accept my apologies. As a calorie counter myself, I know how important it is to have accurate nutritional information. I do hope you forgive me. Also, I’m so glad to hear you enjoyed the smoothie!! Be careful with the special low calorie diets. I bought a fitbit and used that as per the guidelines, I was able to eat any food while keeping under the calorie count for the day. I was also able to eat over 2000 calories on the fitbit diet if I chose to perform more exercising. It is the first diet I went on in my life. I lost the weight in 2013 and kept the weight off because I did not have to change any of the foods I ate. If I was required to only eat 1000 calories, I would have had a very difficult time. omg-this looks so good! I keep my smoothies very simple, but I think I really need to change it up and add more ingredients to my smoothies! This smoothie is the bomb – you must try it!! That’s it… where can I get my mitts on some Koeze??? Maybe I just need to come over and we can sip on these smoothies before picking myself up a case orrrr seven? I’d love to sip on this luscious smoothie for breakfast, Liz! It looks SO delicious. I can practically taste it from here! This recipe sounds excellent, and especially like something my husband would enjoy. We would add protein powder to it to bring up the protein levels to what we need. Looking forward to making this. Big bonus points for having ice cream in there and no chia seeds or green veggies. :) Of course I’m going to have to ask you to have an extra one of these for me since we can’t have pb here. Booo. I miss it! Loved all three Recipes! I think my favorite was the cottage cheese and Avocado one, I had never thought of that combo before… Really yummy. I also love the smoothie I am trying to cut calories a bit more so I would substitute the all natural PB which I Love but can be high in calories with the product PB2 since it gives the same flavor in a smoothie and still adds protein but a few calories less…as always thanks for your great Recipes and tips I love your blog! I’d been thinking of making something similar for my wee Cooper with a little nutella in it. I love the combo of peanut butter and bananas… YUM! Your smoothie recipe looks delicious! I’m going to make it this morning and I can hardly wait to try it. Thanks so much! Oh I’m all over this! !